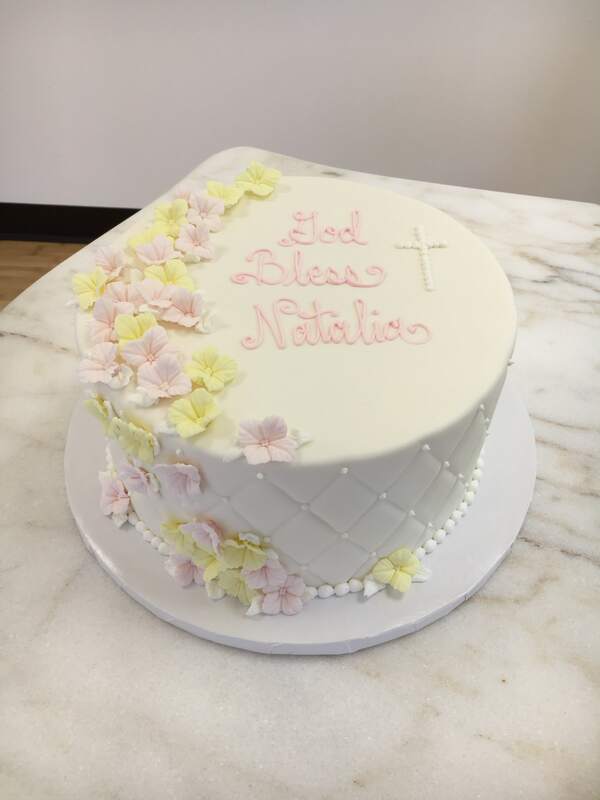 This cake is covered in white fondant and has a quilted pattern on the sides. 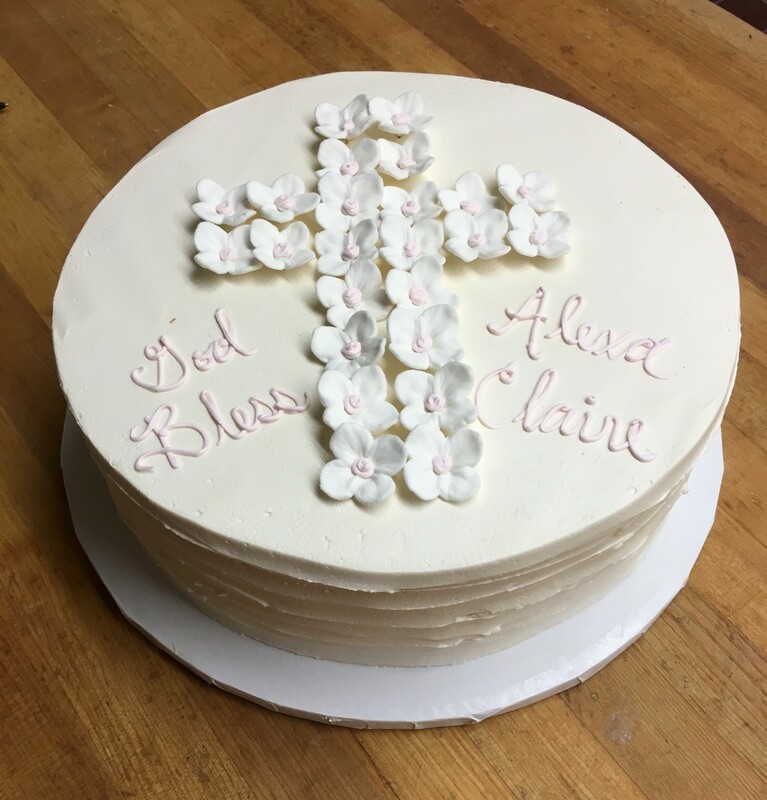 Handmade pale pink and pale yellow hydrangeas are cascading across the top and down the side of this cake. 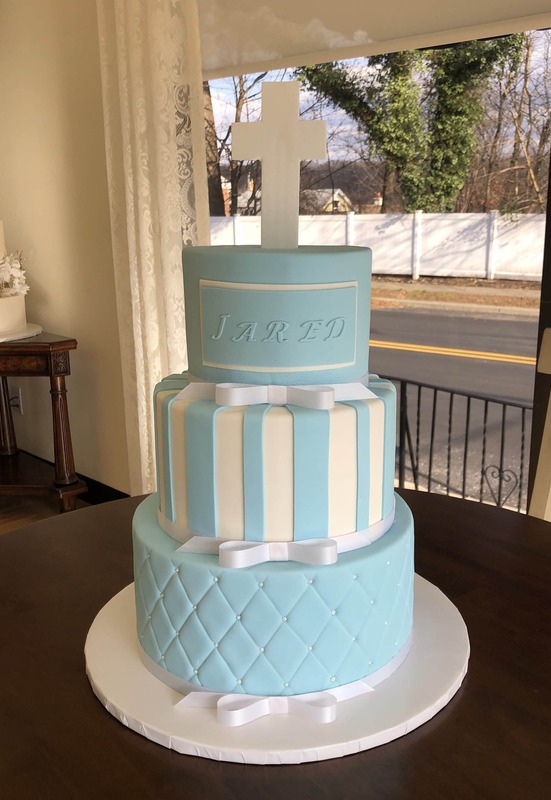 This full fondant 3 tier baptism cake features a quilted pattern on the bottom tier, stripes on the middle tier and a simple fondant name plate on the top tier. 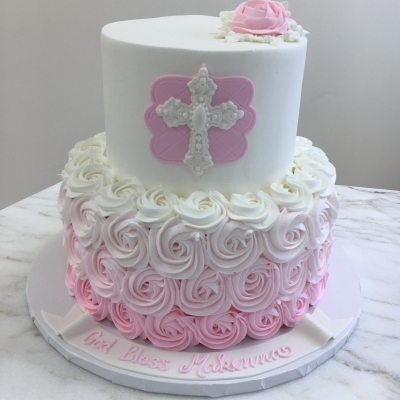 This pretty little 2 tier cake has pink ombre rosettes on the bottom tier and the top tier has a smooth white buttercream icing and an intricate fondant cross in front. 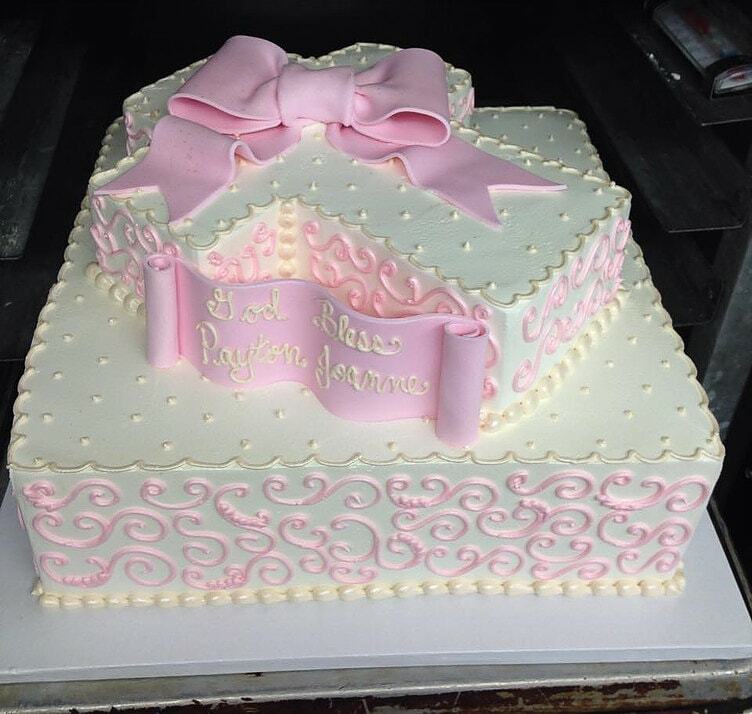 2 tier cake with white rosettes on the bottom tier, a pearlized white top tier and a pretty pink fondant bow topper. 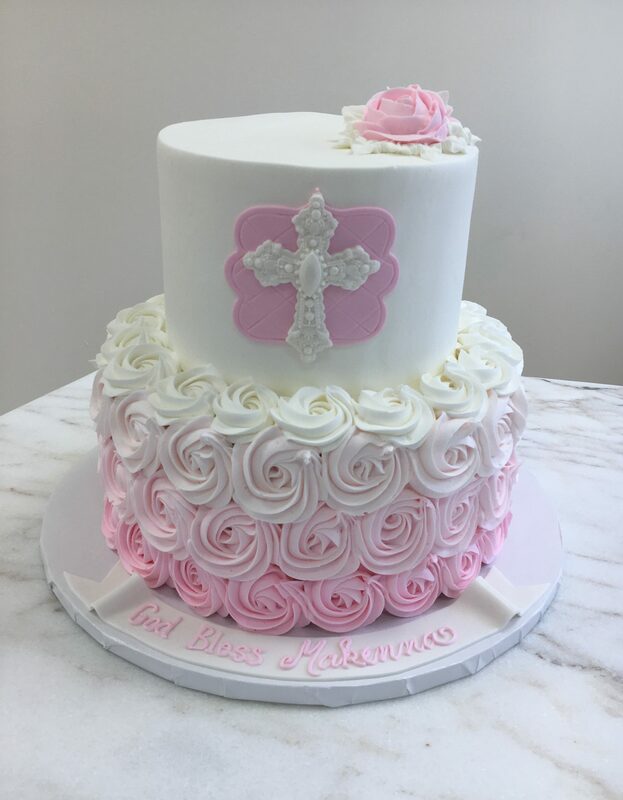 This white buttercream iced 2 tier cake has pretty pink buttercream roses, pink swiss dots and a hand made cross on the front of the top tier. 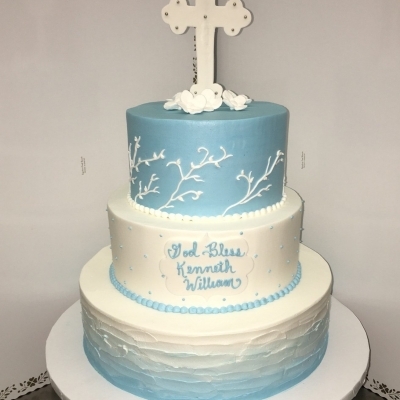 This 3 tier communion cake is iced in white buttercream and has blue fondant accents, along with blue buttercream roses on top and a white fondant cross topper. 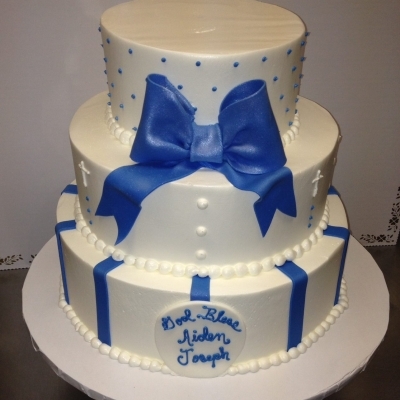 This 3 tier cake has a textured, ombre blue bottom tier and accent top tier in blue with a white piping design to match the invitations. 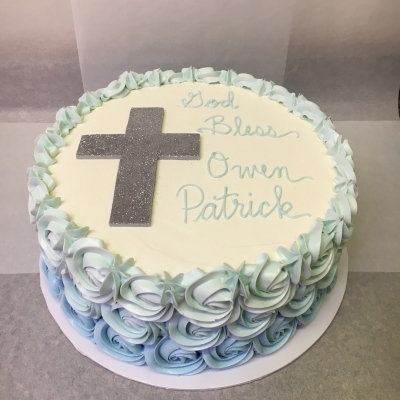 The cake is topped with a fondant cross. 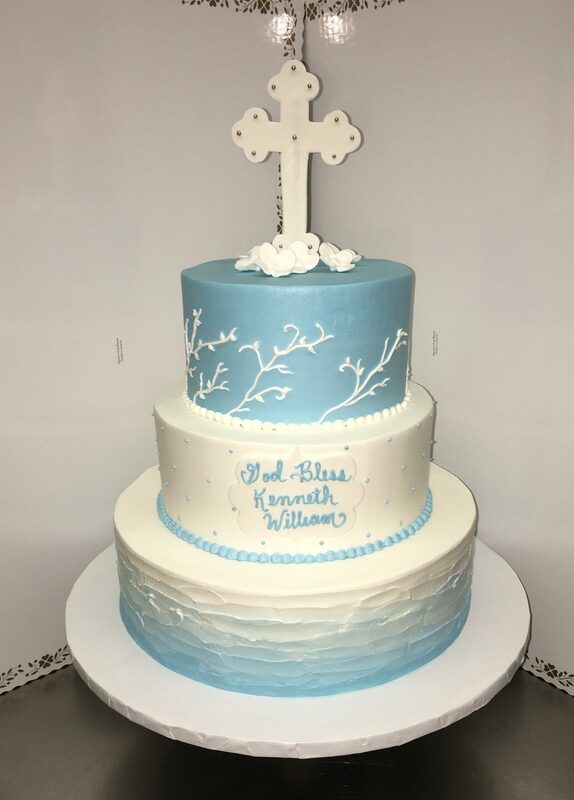 This 3 tier Baptism buttercream iced cake with blue fondant accents. 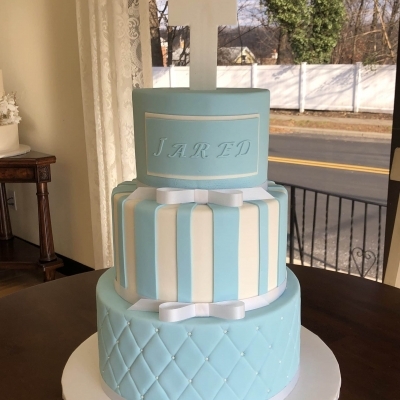 3 tier square baptism cake, with alternating baby blue and white tiers. 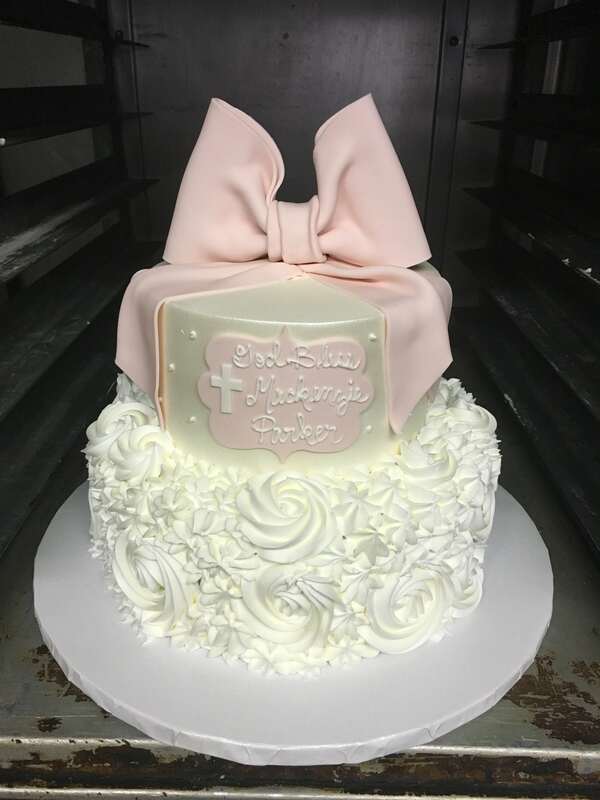 The cake is topped with two fondant baby booties. 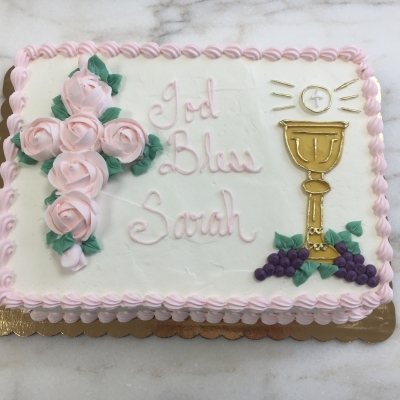 This cake is iced in a pale pink buttercream with a matching pink swiss dot design. 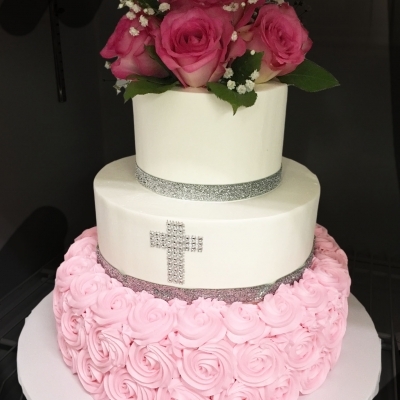 It also has a beautiful cascade of white buttercream roses down the front of the cake, completed with a frosted acrylic cross topper. 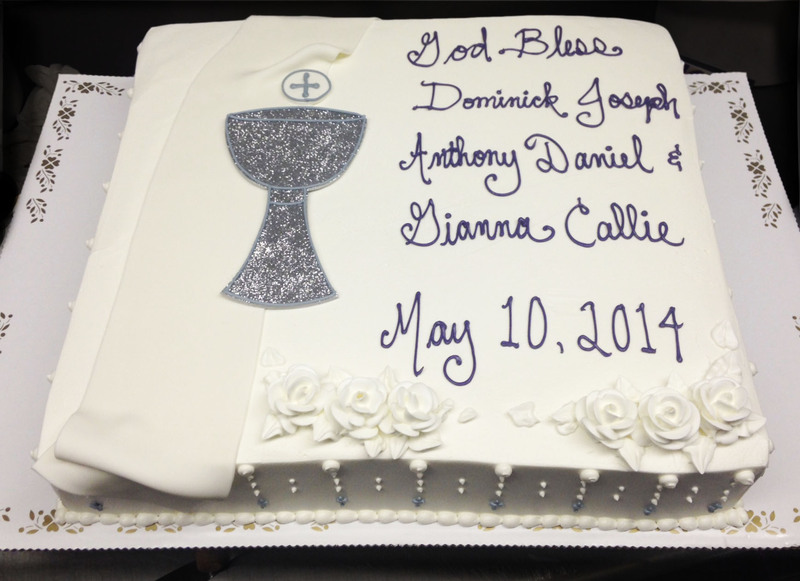 This single tier baptism cake shows that things can also be done simple and be elegant. 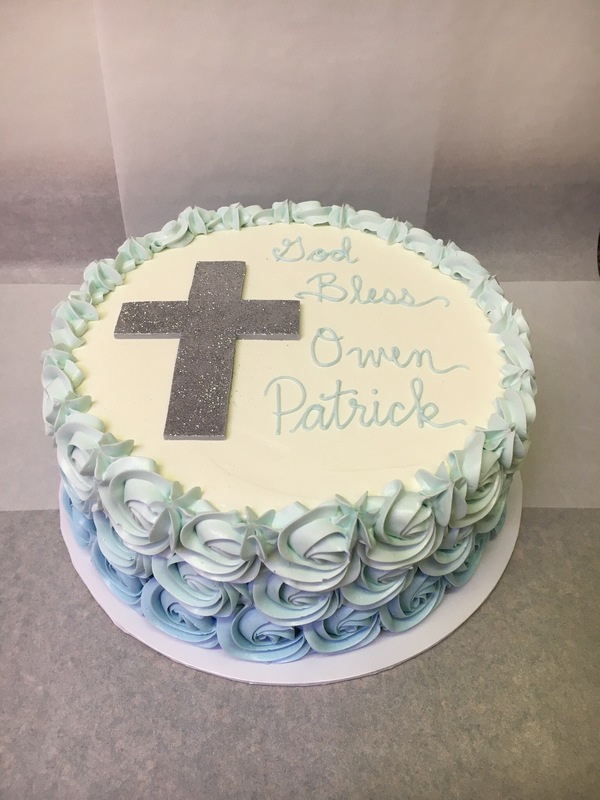 Lets start with the slight ombre light blue rosettes to the statement silver fondant cross. 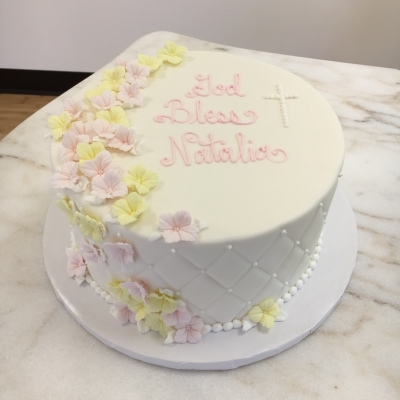 This simple cake has textured buttercream on the sides with a very pretty cross of sugar hydrangeas on top. 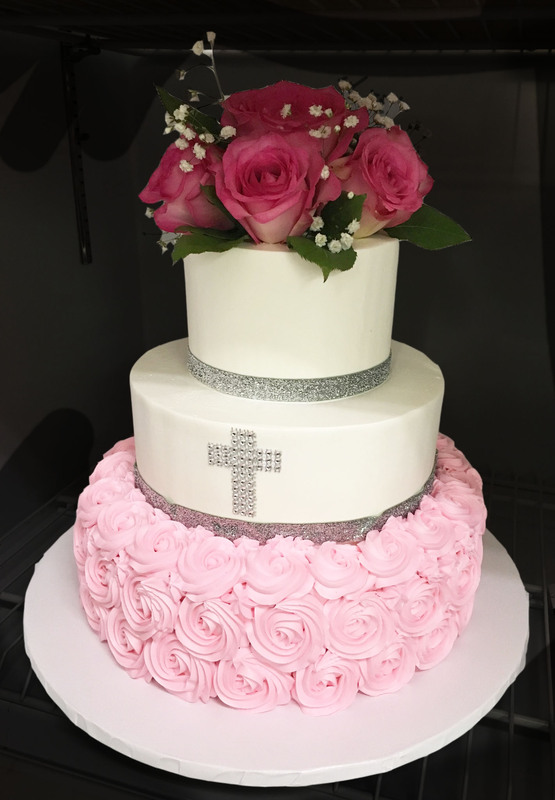 With pink rosettes on the bottom tier, fresh roses on top and lots of sparkle, this religious celebration cake will wow your party guests! 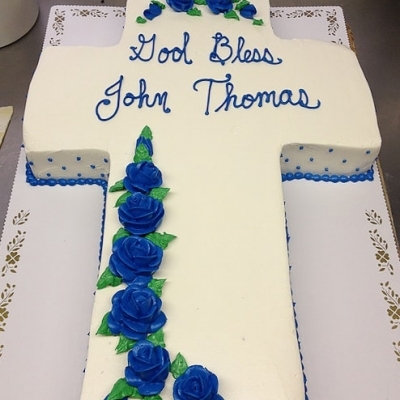 This cake has a square bottom tier and a cross cut-out cake on top. 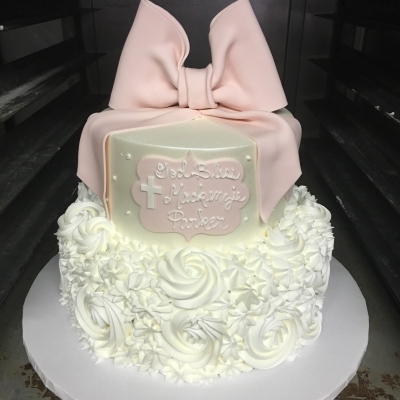 The whole cake is iced in ivory and has pink accents and a large pink bow on top. 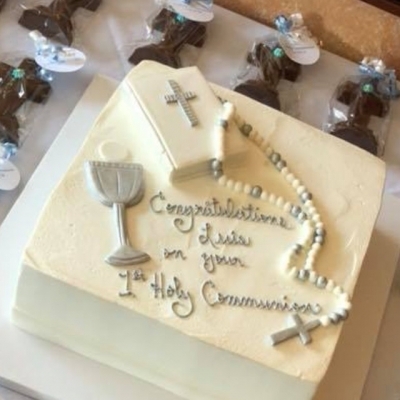 This baptism cake for triplets has white buttercream icing, a beautifully sparkly silver fondant chalice and a few buttercream roses. 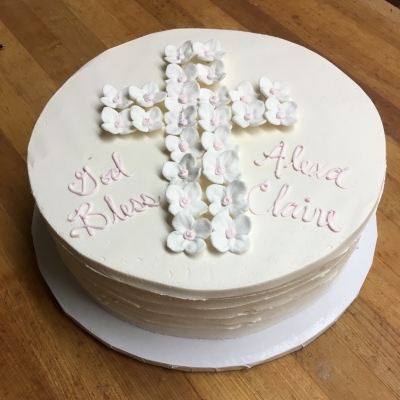 A square cake with fondant decor for a communion. 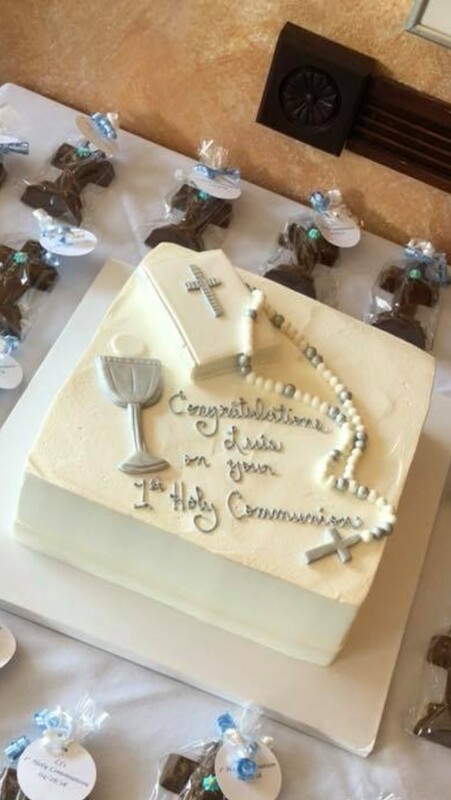 The silver and white colors adds that elegant yet simple touch. 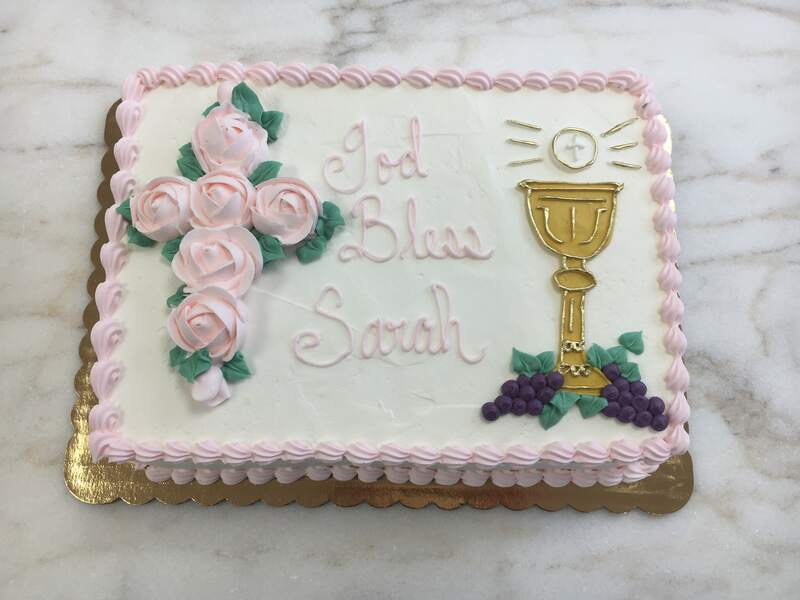 This communion sheet cake is done completely in buttercream, including the chalice and grapes. 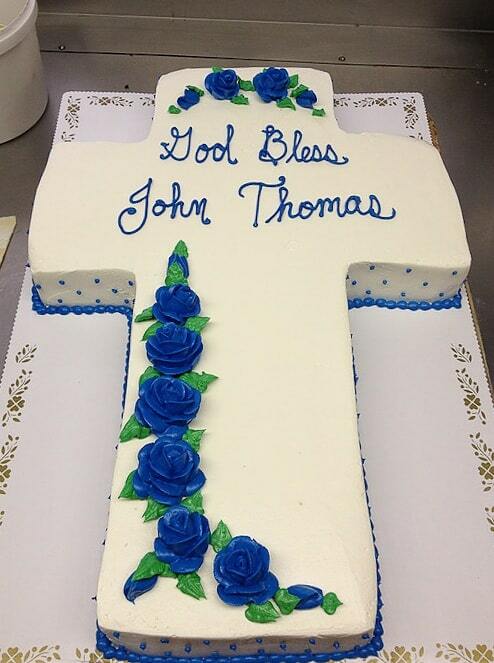 This sheet cake is cut into the shape of a cross and can be customized with any color for the icing and roses! 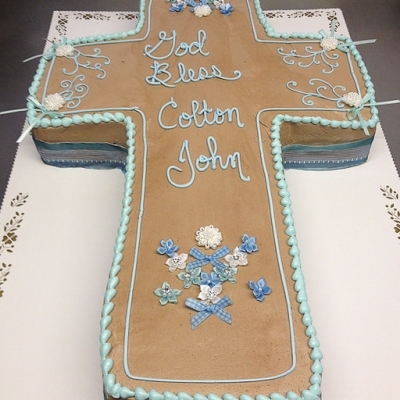 This big beautiful cross shaped cake decorated with blue and white fabric flowers and ribbon to add that special touch. 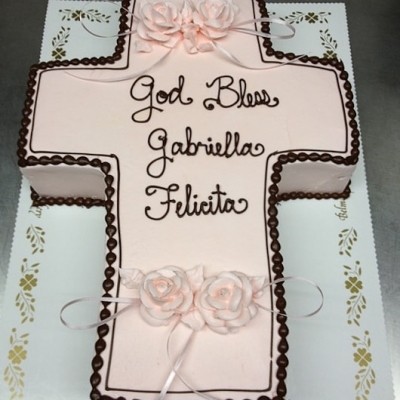 This pink cross cake is iced in buttercream and is accented with a deep brown border and writing. 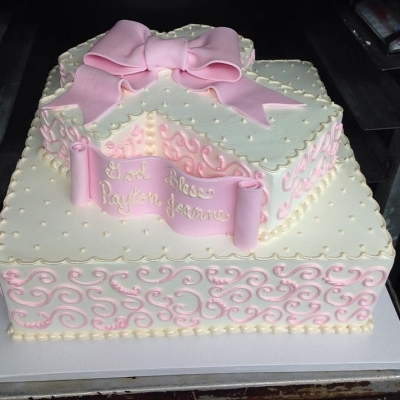 This 3 tier buttercream cake has pink ombre rosettes on the bottom tier and 2 simply decorated tiers on top. 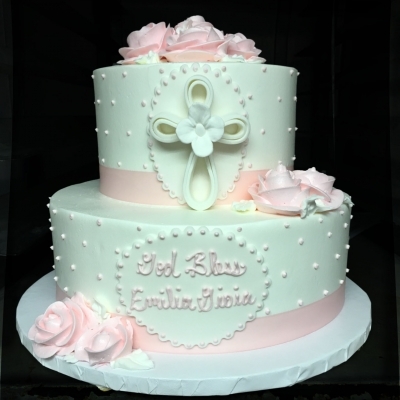 This 3 tier pink buttercream cake is covered with lots of different fondant flowers. 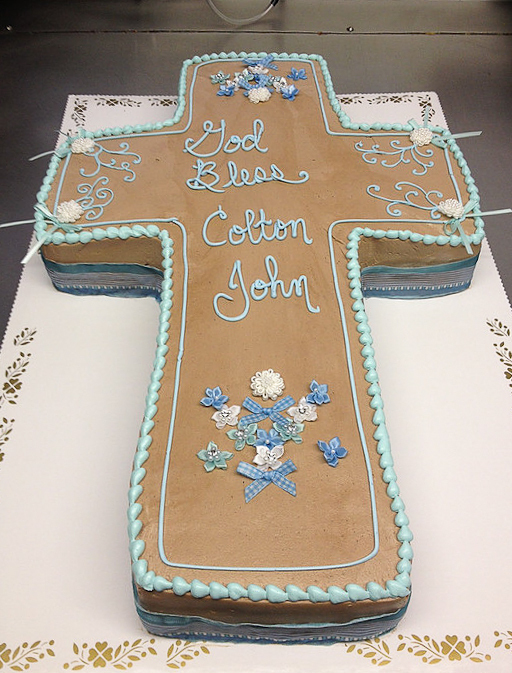 This 2 tier buttercream iced cake embellished with gold accents and sugar flowers. 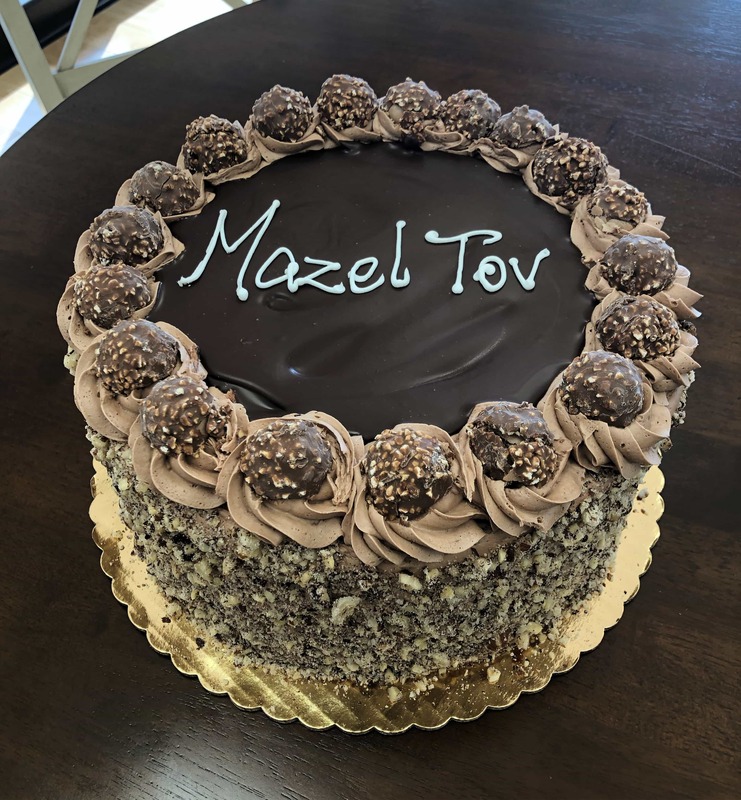 Perfectly done with purple ombre rosettes on the bottom tier. 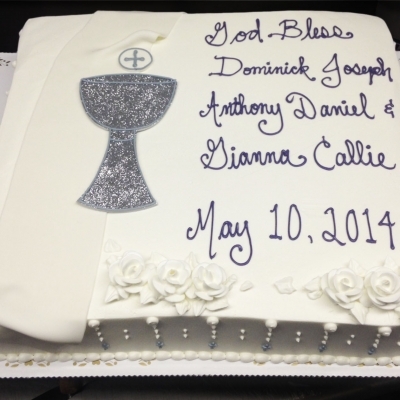 This beautiful 2 tier Baptism cake is covered in fondant. Adorned with a pink fondant bow and a quilted effect on the bottom tier. 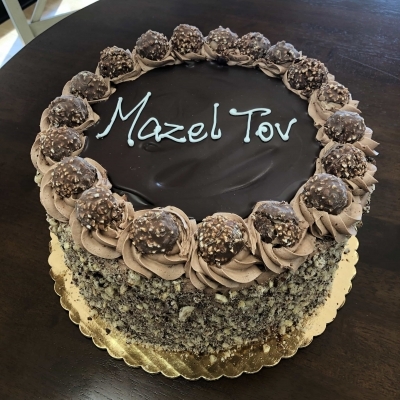 This delicious Ferrero Rocher cake has chocolate cake inside with Nutella filling, along with a Nutella buttercream icing, crushed hazelnuts, chocolate ganache and Ferrero Rocher candies.